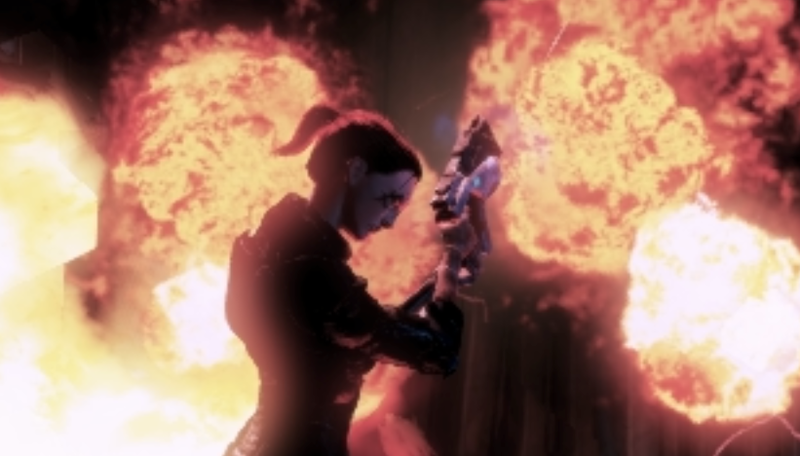 Ok so we have seen some rather compelling evidence to support the notion that Bioware fully intended an element of Indoctrination to be a viable interpretation of the ending. If this is true we would expect to see lot's of other subtle clues throughout the game. After all we are led to believe that the ending was mapped out really early in the development cycle. As it happens, fans have pointed out a lot of very interesting things that certainly could be clues of Indoctrination. However taken alone these things are not very convincing and IT-debunkers like to focus on these things as proof that IT-believers are "clutching at straws". So let's be clear here. These things are being pointed out so that taken as a whole they can be seen as really cool possible clues that add weight to the possibility. They are not being presented as single pieces of evidence that offer any form of singular proof. As the theory goes, Shepard is in fact still unconscious (or-semi-conscious) on the street of london at the approach to the beam. So it's very interesting to note that there are some striking similarities between elements of the approach to the beam and the decision chamber, as seen above. Mere coincidence? It certainly could be. Another very interesting thing that has been pointed out is the fact that several times when Shepard see's the boy alive he is next to some form of warning sign. A warning from Shepard's mind or another coincidence? It's also worth noting that the Warning sign in the duct seems to be unique. Not only is it an unusual symbol to warn against an electrified duct (a lightning bolt to the brain?) but if it appears nowhere else in the game, does it not seem likely that Bioware very intentionally placed it here with some purpose? And here is another odd note. Shepard mentions this boy to Garrus in a conversation on the Normandy, and lo and behold the very moment he mentions the boy we can see a warning sign behind his head! A sign that we barely got a glimpse of before, but as soon as Shepard mentions the boy, BAM there it is! Upon approaching the room where Shepard see's the boy in the air vent, you can actually see the boy on a balcony outside the room. This is odd because this location is a good distance from where Shepard saw him playing outside only about 5 minutes earlier. 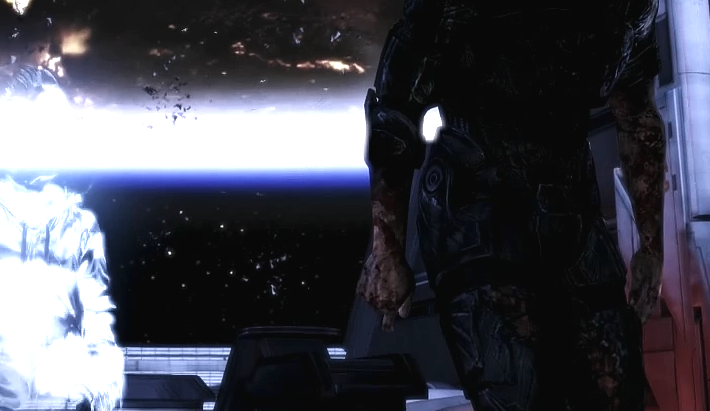 It seems unlikely that he could have reached it, and if he did escape there once the Reapers attacked why is he so casually watching the devastation from the balcony? Another odd point is that during the walk to this location across the building roofs, the "garden" where the boy was playing no longer seems to exist. 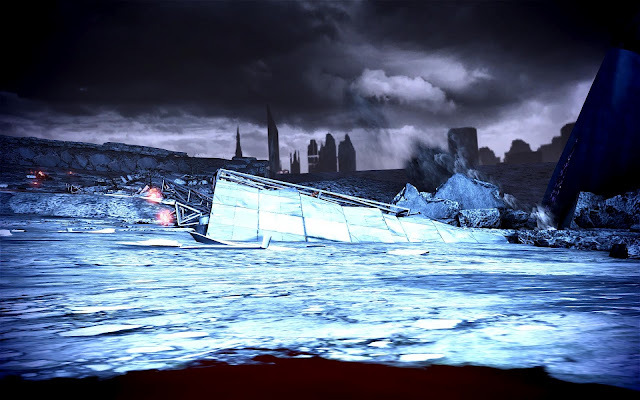 Or rather it is now blackened out, as if the Reapers intentionally burn that place to a crisp. Anyway back to the boy on the balcony. He appears to see the Husks coming and runs into the room behind him. However the door is clearly locked and does not unlock to allow him to enter. It simply opens for him while remaining locked. Simply a bug or a clue? Shepard: "Come here, I need to get you someplace safe. Take my hand." Boy: "You can't help me." Why would a scared boy refuse help from a military person at a time like this? If Shepard can't help the boy get someplace safe, who can? At this point Anderson calls out to Shepard and we hear the familiar Reaper growl, it seems to happen very intentionaly when Shepard's conversation with the boy is interupted. Shepard looks away at Anderson and then back into the vent, where the boy has now vanished. No sounds of the boy turning around and scurrying away into what would be a noisy vent are heard. He simply vanishes and again more Reaper growls are heard. See a video of this here. Note when Shepard sees and hears the Reaper outside at about 25 seconds it sounds different and distant to the growls when interrupted. These growls are important because they do not seem to come from the Reapers outside, those sounds are very different. Instead they sound like they are in Shepard's mind. As if it a reaction from the Reapers to Shepard breaking an attempt at Indoctrination. "The whispers in his head grew to an angry roar as Grayson struggled to regain control of his physical form. He shut them out, ignoring them as he focused all his energy on the simple act of taking a single step." I mentioned in section 2 the strange fact that Shepard wakes up after being hit by Harbingers laser to find that all your weapons are gone. However conveniently you find what appears to be Anderson's gun. So where is Anderson? How come he dropped his gun by Shepard but is nowhere to be seen, even though he is going to follow Shepard into the beam soon. NOTE: It has been discovered that the name change between "Anderson" and "Admiral Anderson" occurs at other times in the game and probably has no relevance. So focus on the gun in these images. "I noticed when examining the game files that in the red ending files for both the carnifex AND predator are loaded, while in the green and blue only the carnifex is loaded. 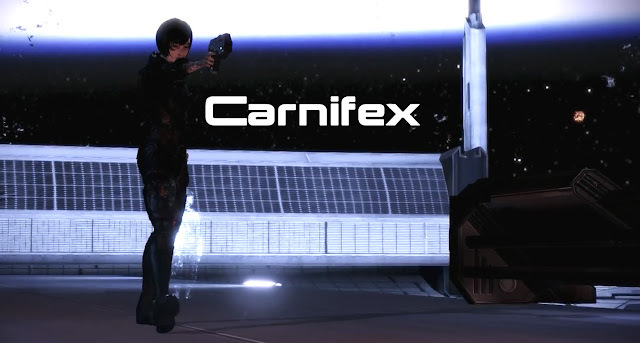 The carnifex is the gun Shepard used when shooting Mordin, so is presumably associated with negative outcomes/bad situations. Meanwhile the predator is the gun TIM takes from Anderson, and Shepards usual gun. Anyway, if you choose Red ending, at the VERY last second, when the explosion occurs, you can see that Shep is no longer holding a carnifex but a predator. " 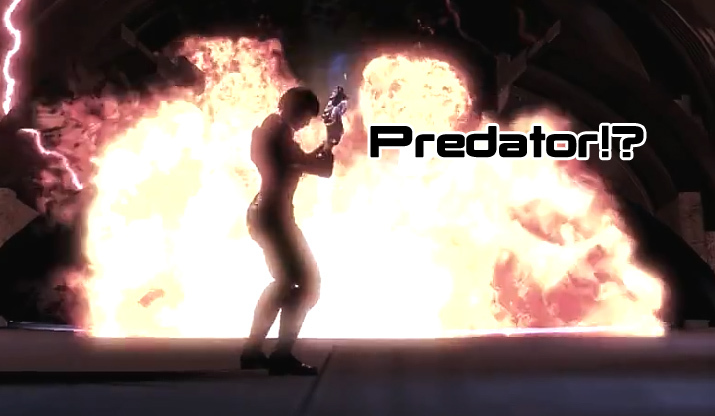 So if you choose the Destroy ending, it appears the gun changes from the Carnifex to the Predator! I will use SS2Dante's own thoughts on what this possible intentional symbolism means. "The gun, I believe is a sign of rebellion. You use it to activate destroy, while in both control and synthesis you toss it away. The first thing you see upon awakening after Harbingers attack is the gun. but each"step" into the dream removes focus from it. When you wake up after the conduit you have to walk forward and "find" the gun on the floor, and when you're talking to the Catalyst you're holding the gun (observe sheps trigger finger in place) but it's invisible." I took screen shots myself to verify from a video of the ending someone else posted to youtube! And finally here is a great video made by BSN member prettz that outlines this oddness. He used the PC hack flycam to capture this moment and the strangest part is that the gun changes at the very moment the shockwave from the explosion hits it. Take note of the 4 minute mark where he captures from an angle impossible in game by using the flycam. The gun changes the moment the shockwave hits it! UPDATE: Prettz has now done a second video further investigating this oddness. While I find it very hard to believe Bioware put this in as an intentional clue , it is very very odd nonetheless. And even if it is a glitch, it does seem to fit nicely with IT. 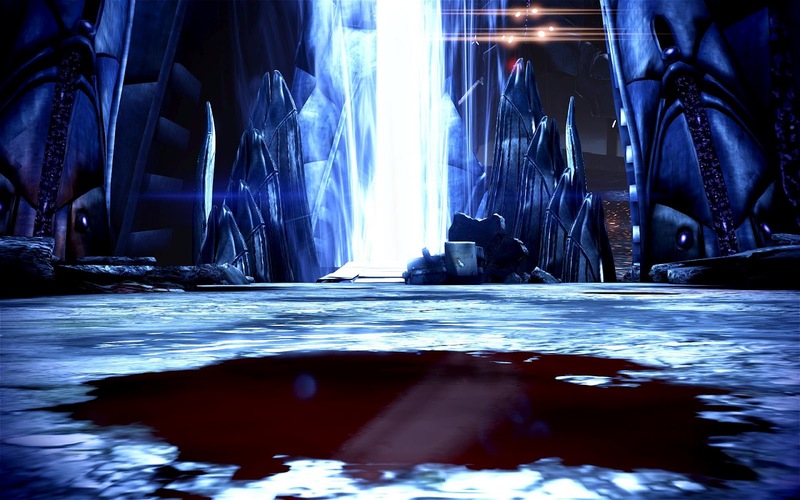 After the first few shots Shepard shoots at the chamber Shepard begins to walk normally as if unharmed. Then for the final few shots when Shepard shoots at the chamber, a moment later the screen will flash with the same transition that is used to signify a transition from a dream to reality! Could it be that this signifies Shepard breaking away from the Indoctrination hallucination? Here is one that while interesting, I have now discounted. On the ramp to the panel in the Citadel and in the entry to the decision chamber there are several places where a sign that reads "1M1" can be seen. And the sign is mirrored on the opposite side as seen above. Two interesting things about this. First of all why is there writing on a part of the Citadel that was built by the Reapers and no other organic has ever been!? And why is it written in Human English!? At first I could only think of two explanations for this. 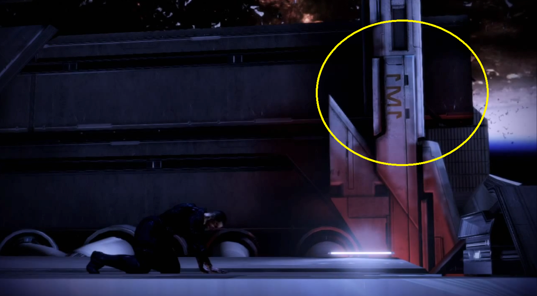 Bioware intentionally placed it there as a clue to something. Bioware are lazy and used an art asset on the Citadel that was supposed to be for Human structures. If the first one is true then what does it mean? Well some fans put forward some rather amazing theories on that. It get's a bit technical so I'll leave the link here for a full explanation. But here are some very interesting highlights. 1: The act of moving toward union or uniformity. 3: The intersection of three electron beams for red, green and blue onto a single pixel in a CRT. Or could it be that like the similarities between this part of the Citadel the Shadow Brokers ship and the Collectors ship, this is a clue that Shepard is constructing these places from memories of others places? There is clearly a third option why this could be there. 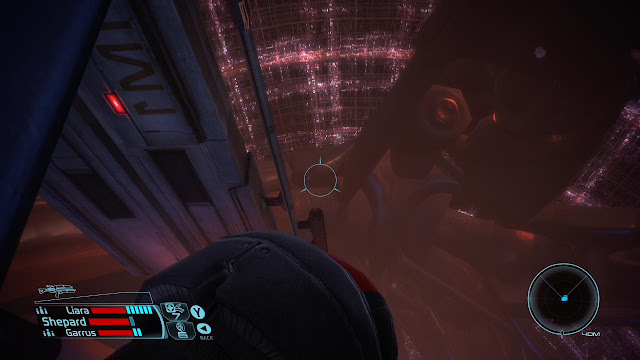 Because it is already an established visual from the Citadel tower in the first game and Bioware were maintaining visual continuity despite the fact that it lacks logic. So I think we can discount the dioptry formula connection as coincidence. There is no way that was planned from the first game. And while it remains a mystery why human English is used on a structure that was supposedly built by the Reapers, it does seem that it's inclusion in the ending is meaningless. 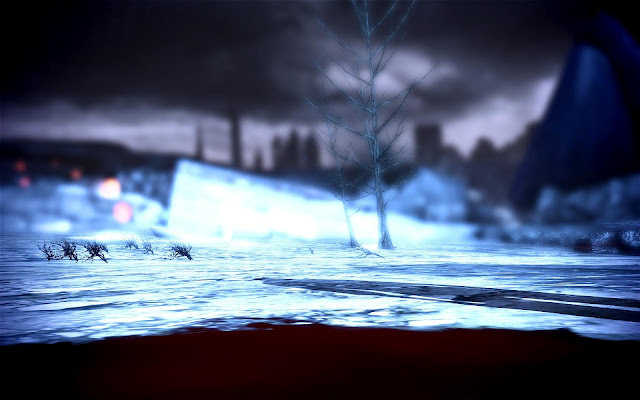 A lot has been made of the trees scattered around the beam after being hit by Harbingers laser and if they relate to the trees in Shepard's dreams. And while this was once offered as one of the main pieces of evidence for Indoctrination I originally chose not to include it simply because it has been shown that there are many trees around that area even before Shepard is hit with Harbinger's laser. However prettz over at the Bioware Social Network Forums took these screenshots which I think serve to reignite this point as legitimate evidence. As you can see there are clearly trees and shrubs where there were none before. And you have to ask, why would Bioware remodel this area for after Shepard wakes up? There really is no reason to have a separate model map for this area with new trees in it. You don't need to do that to add some flipped over Macko's. You don't even need to do that to add those weird piles of bodies mentioned in 2c. 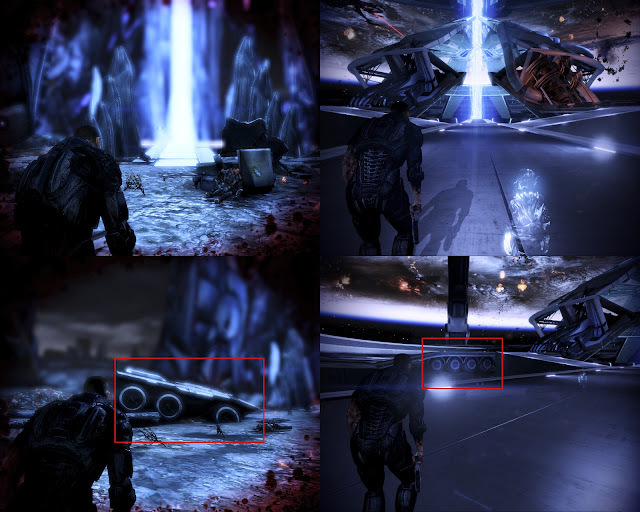 So what possible reason could Bioware have for adding trees into this area at this point if not to make everything strange and dream-like and as a call back to the trees in Shepard's earlier dreams? The Codex entry on Indoctrination mentions "feelings of being watched" and "buzzing or ringing" in a persons ears. So it is interesting that in the game James mentions a strange hum. I can't recall if it was more than this one time but it's a strange comment, possibly a clue? There also seems to multiple times in game where characters make reference to being watched. James on the fuel station mission says "Yeah, I feel like we're being watched.". Tali on the Rachni mission can say "It feels like we're being watched. Let's find the nest and get out of here.". These could easily be coincidences and it's worthy of note that if Shepard were the one being Indoctrinated, then it should be Shepard that mentioning the feelings of being watched and the hum. Ashley: "I can't believe he was responsible for all of it. Was he indoctrinated?" Shepard: "It's hard to say." Ashely: "How do we fight something that can worm it's way into your head?" Shepard: "I don't know. But we don't have a choice." 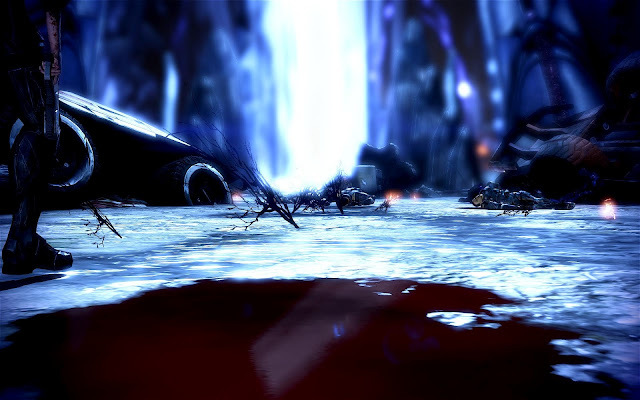 Liara: "This nightmare never ends!" Shepard: "The hell it won't! We get to this artifact, and we can all wake up." If you bring Garrus: "Drinks will be on me." Hi, it´s me again xD. I don´t think I saw this thing on your blog, if it´s there then I´m completly blind and stupid xD. I really don´t think that this was Biowares mistake it just seem...too much. Thanks, you are right I had not gotten that piece of evidence yet! Thanks. Will begin adding a detailed examination of that today! Woah, I never noticed the gun changing in the destroy ending. I don't know how it relates to Indoctrination, but it is cool nonetheless. This a very well written document, it informed me of new pieces of the Indoctrination Theory, here are some other pieces others and myself have found to help make this list more complete. If you've played ME2's Arrival DLC then Shepard has spent 2 days literally right next a Reaper artifact that had already indoctrinated the whole base, you can also find logs of the crew from before they were indoctrinated talking about the strange dreams they're having. At the end of Arrival when Shepard is being questioned by Admiral Hackett, Hacktett asks is Shepard alright and Shepard reponds "I'm fine no more visions if that's what you're asking". Visions after being exposed to a Reaper artifact are a major symptom of indoctrination. Ash/Kaidan make two other comments about Shepard being mind controlled; during the Mars when you're trying to trick the Cerberus troops into sending the tram over they'll make a comment about how Shepard could be the Illusive Man's puppet and immediately after will say something like "you would even know if they were controlling you somehow". Javik (the downloadable squad member) if brought on the Tuchanka Bomb mission with Garrus will say something like "controlling an enemy without them knowing it is a cunning strategy" (not an exact quote). Bioware has long history of putting plot twists into their games, if the IT isn't true then ME3 has none worth mentioning. They also foreshadowed KoToR's plot twist (the PC being Revan) in a very similar fashion to how it appears that they have foreshadowed Shepard's indoctrination. They also have hallucination sequences in at least 2 of their games; a Baldur's Gate 2 (I think its the 2nd) expansion had a hallucination sequence at its end and if you don't break free you failed (you were also fighting entities you could control minds), Dragon Age Origins had a kind of hallucination/dream sequence that happens when you're fighting to clear the Circle of Magi tower. Thanks. I have been meaning to add an entire section on The Arrival DLC. 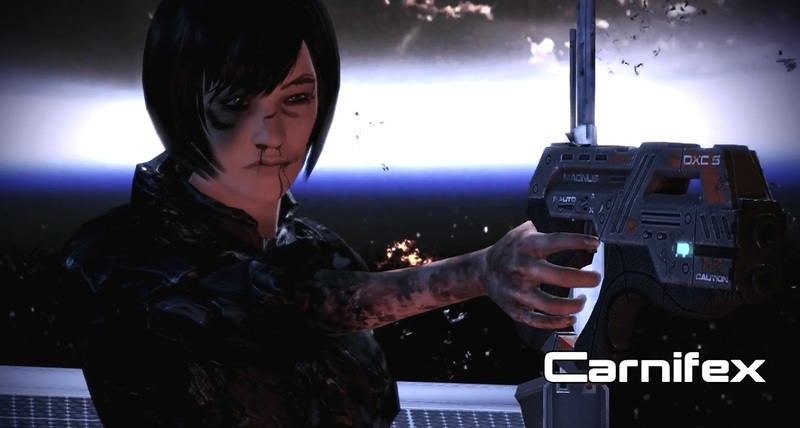 I am currently replaying ME2 and when I get to The Arrival (will play it last which makes most sense). I'll make notes and capture footage of the relevant things for inclusion. Good point on the warning sign with Garrus, had not caught that. Will add. I'll look into those other things too. I intend to add a section on Bioware's past twists too. I also link it in the Introduction. Wait... Sheppard says the boy "Come here, I need to get you someplace safe. Take my hand.""..... I NEED? How does that make sense in english syntaxis? How about "we need to go someplace safe" or "I will get you someplace safe". But instead he claims that he "needs" to save this boy. He needs to, or at least his mind is making him think he needs to. I don't think t\we can give much relevance to the term "I need to get you someplace safe". Seems to me like common usage in a situation where you want to help someone in a dangerous situation. Hey, another element of James being indoctrinated. A piece of evidence shown in the video logs you find in the derelict reaper of the Cerberus science shows that a symptom of indoctrination is shared memories. They both think to remember their wifes, but they remember the exact same girl. James seems to have the same effect with Sheppard. He always, always has something to say about people you meet on missions, even if he wasnt there at all. Even more, he has something to say about that scientist who is in a romance with Anderson... how the hell does he know that when Sheppard, and Sheppard alone, had that conversation with her?. And it gets better... remember when he wants to talk privately with you? what story does he tell you of why he was promoted to N7? Its the story of Mass Effect 2! Defending a colony from collectors and destroying a collector ship. Too much of a coincidence. I know it might be a little late to respond to this but in case there will be other readers in future: The thing with Vega and defending a colony from collectors and destroying a collector ship is because he actually DID defend a colony from collectors and destroyed a collector ship. It was in Mass Effect: Paragon Lost. An anime produced by BioWare, FUNimation, T.O Entertainment and Production I.G where James Vega is the protagonist. 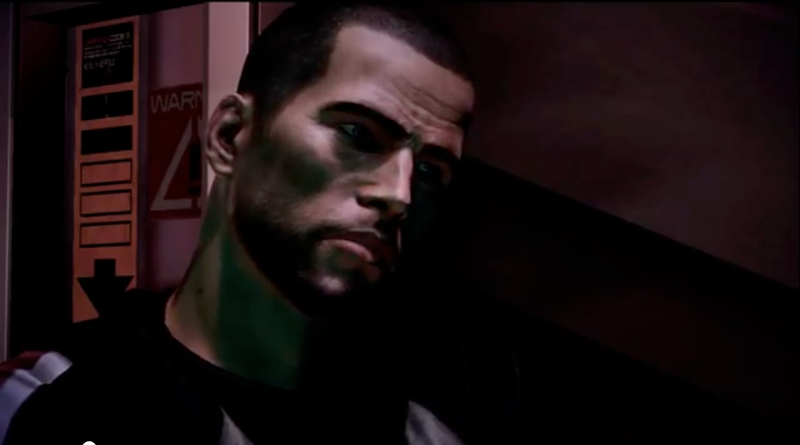 So the anime is canon and the James Vega in the anime is the very same James Vega who joins your crew in ME3. Good call. This is correct. I'll have to check on the bit about him knowing about the scientist in a relationship with Anderson.